Like most 13-year-olds you know, Harriet spends time thinking about her school grades, getting along with her brothers and sisters, and the fact that she would prefer her school uniform to be yellow, not blue. Harriet is growing up in Uganda and her family lives in poverty, so she also spends time thinking about more serious things. Things like having enough food to eat, and whether her family will have enough money to meet their needs. Because of the desperation her family faces, she also has to worry about being forced into child marriage. Canadian Feed The Children’s programs build awareness and resiliency, and work to eradicate the poverty that leaves girls so vulnerable. But the hard truth is that we still lose girls to child marriage. As we reflect on the Day of the Girl Child on October 11th, we pause to think about the three girls we lost from our sponsor a child program to child marriage over the last year: a 17-year-old from Ghana; a 16-year-old from Ethiopia; and the youngest, a 14-year-old from Uganda who has already become a mother. Our programming has been resoundingly successful at keeping girls in school: girls in CFTC-supported programs are significantly more likely to reach higher education and escape child marriage. But, for Canadian Feed The Children and our local partners, these three girls are three too many. Losing their childhood and chance for education because of child marriage has far-reaching effects: young brides are more likely to be burdened with higher rates of HIV, domestic violence, sexual abuse, and death by childbirth. Pregnancy and childbirth are a significant cause of death for girls under 18. Infants who are born to young mothers are much more likely to die in their first year. If a child survives, she or he is more likely to suffer from malnutrition. All children deserve to enjoy their childhood, but many girls are forced to grow up too soon. This is especially true in remote communities where families struggle to feed their children, and where tradition supports child marriage as a solution to constrained family resources. Harriet’s situation – as a girl entering her teens and growing up in poverty – makes her particularly vulnerable, as it does so many other girls in Africa and around the world. In Uganda, for example, half of all girls under 18 are married. Harriet lives with her guardian, her Aunt Monica, who knows this reality all too well. At only 30, Monica cares for seven children in her home. Monica wants something much different for Harriet, and she knows that staying in school is Harriet’s best hope. “Education is good because it keeps girls in school. Those who would have lured them into marriage are scared off because they are still in school,” Monica told us. While her aunt and guardian knows that education will save Harriet from child marriage and early motherhood, Monica has struggled to provide it for her. The cost of education is expensive, and older girls are often pulled from school to help earn an income for their family or are forced into marriage to relieve the family of their expenses. By marrying off one child, the others can still eat. This pattern is repeated again and again because of poverty, hunger, and tradition. 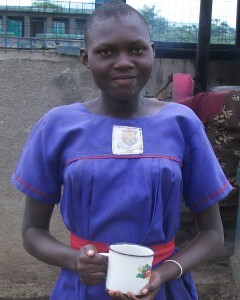 Today, a CFTC child sponsorship is keeping Harriet in school. 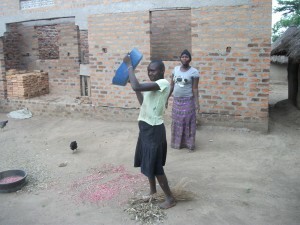 The sponsorship has helped lift the burden of costs for Monica to ensure her niece can continue with her studies. It also provides Harriet with a nutritious meal a day, reducing Monica’s food expenses. Working in collaboration with our community partners, CFTC programs take an additional step to ensure that the community in which children live is working towards self-sufficiency and resilience. With the support of our local partner, UCOBAC, CFTC has helped Monica learn new ways to farm and earn an income to help lift her family out of poverty. By creating more financial stability, more confidence for Monica, and through additional measures that support community resilience, we lessen the likelihood of Harriet being pulled from school. 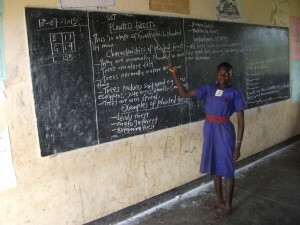 There are additional barriers to education for adolescent girls than merely the expense. Many girls drop out of school because the infrastructure is not able to accommodate the physical needs of adolescent girls. Female teachers and facilities that respond to growing girls’ needs are also essential. Thanks to our generous donors, Harriet attends a school with private latrines – a simple, effective way proven to keep girls in school at the most vulnerable early teen years. Further still, with the support of our partner, we have made s ure the teachers at Harriet’s school are properly trained so that they can guide her to reach her full potential. We also work in Harriet’s community to educate guardians on the importance of girl’s education and the harm of child marriage, while empowering girls like Harriet to self-advocate for their right to a childhood and an education. By supporting these programs, our donors have helped to reduce the likelihood of Harriet being forced into child marriage and giving her the help and hope she needs for a brighter future. Our work doesn’t end when we learn that a child has become engaged, married, or even had a child of their own. Our local partners visit the child’s home to encourage the family to allow the child to return to school. Often, we have success in bringing them back. But sometimes, even our interventions cannot overcome the entrenched practices supporting child marriage. It is a powerful reminder that despite the life-changing work our donors make possible, the children we support are still extremely vulnerable.